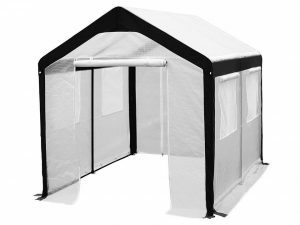 - Strong durable reinforced transparent PE cover manufactured from heavy duty material. - Constructed with heavy duty powder-coated steel frame resists chipping, peeling, rust and corrosion. - Windows are equipped with insect netting to help control pests. - Big foot plates provides more stability. - Easily assembles with no tools required. Lightweight to remove.